The Iowa Association for the Education of Young Children is an affiliate of the National Association for the Education of Young Children. This national professional membership organization works to promote high-quality early learning for all young children, birth through age 8, by connecting early childhood practice, policy, and research. They advance a diverse, dynamic early childhood profession and support all who care for, educate, and work on behalf of young children. NAEYC comprises nearly 60,000 individual members of the early childhood community and 50 regional Affiliates, all committed to delivering on the promise of high-quality early learning. Together with these partners, NAEYC works to achieve a collective vision: that all young children thrive and learn in a society dedicated to ensuring they reach their full potential. Goal: NAEYC is a highly valued, credible, and visible organization. Goal: NAEYC reflects excellence in all aspects of organizational health and vitality. Goal: NAEYC cultivates leadership and incubates innovative strategies that propel the field, profession, and systmes of early learning. When an individual joins NAEYC, she/he is joining the national association as well as one or more affiliates. Your membership with your chosen affiliate(s) also includes additional benefits, such as professional development, conferences, and networking opportunities. 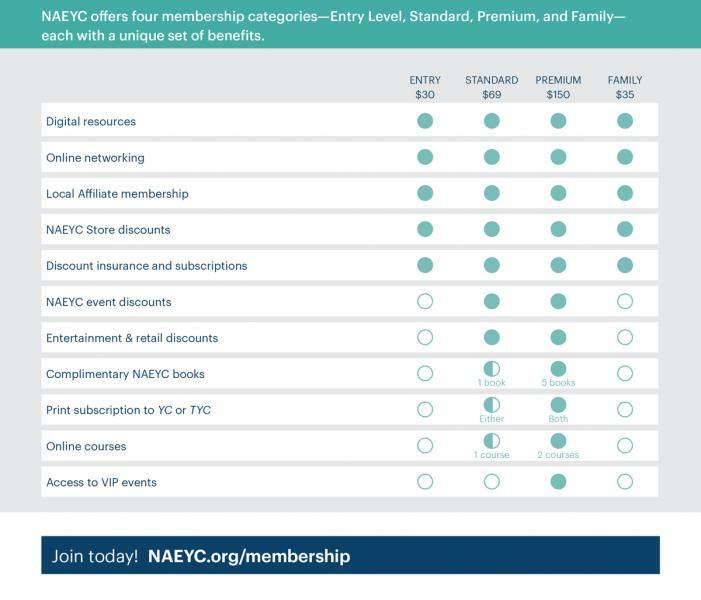 Membership benefits vary by the option an individual selects: Entry, Standard, Premium, or Family. NAEYC's print and online publications have significant content -- archived for searching on topics of interest, and new books and other resources are created and disseminated every month! Comprehensive members receive new books as a benefit of this membership option. Young Children -- NAEYC's award-winning peer-reviewed professional journal; an NAEYC member benefit option; published five times a year -- in March, May, July, September, and November. Issues are organized around topics important to the early childhood education field. Print and online versions are available to NAEYC members. Teaching Young Children (TYC) -- NAEYC's award-winning magazine for preschool educators (school- and center-based teaching staff and family child care providers). TYC highlights current thinking on best practices in early childhood education, innovations in the field, research and its implications, and interesting ideas for and from preschool teachers. An option as a member benefit or available by subscription. Voices of Practitioners -- NAEYC's peer-reviewed, professional online journal. Its main purpose is to provide a vehicle for publishing the research of early childhood teachers, who are often underrepresented as authors in the educational research arena. This publication includes informative articles, resources, and tools to promote the participation of early childhood teachers in teacher research. NEXT for Young Children -- an online professional development guide based on articles in NAEYC's publication, Young Children. This is a member benefit. NAEYC publishes an extensive line of books, videos, brochures, and posters. All these NAEYC materials, as well as selected educational resources from other publishers, may be ordered through the Online Store. NAEYC's books are also available through international distributors in Australia, New Zealand, Canada, the United Kingdom, Continental Europe, Africa, the Middle East, and Asia. NAEYC Website: Topics pages, NAEYC for Families, the NAEYC blog, and more! Three Twitter accounts: @naeyc, @naeycAC, and @naeycINST. The first account is the main account that is populated consistently year-round. The second two are our event specific Twitter handles, for the Annual Conference and Institute, respectively. NAEYC convenes the Annual Conference & Expo in November, the Institute for Early Childhood Professional Development in June. Presenters for the Annual Conference and Institute submit online proposals for conducting sessions -- the Annual Conference Call for Proposals is typically posted on the NAEYC website in December/January and the Institute Call for Proposals is typically posted in September/October. Session proposals undergo a peer-review process. Training-of-Trainers programs on developmentally appropriate practice, classroom-based assessment, and communication skills for challenging conversations. Sessions at affiliate and allied organization conferences on a variety of topics including early childhood education, program administration, leadership, and others. Sessions on NAEYC's accreditation systems at NAEYC conferences, at NAEYC's headquarters, and other venues. NAEYC has an online program, Documenting Quality -- with additional online programs planned for the future. NAEYC strives to raise the quality of education for all children from birth through age 8. Accreditation systems are major part of NAEYC's efforts to improve early childhood education; they allow programs to provide the best learning experiences for young children and their educators by meeting national standards of quality. Since 1985, NAEYC has offered a national, voluntary accreditation system to set professional standards for early childhood education programs, and to help families identify high-quality programs. Today, NAEYC Accreditation represents the mark for quality in early childhood education. Over 6,500 child care programs, preschools, early learning centers, and other center- or school-based early childhood education programs are currently NAEYC-Accredited. These programs provide high-quality care and education to nearly one million young children in the United States, its territories, and programs affiliated with the United States Department of Defense anywhere in the world. NAEYC does not accredit other programs internationally (but see Global Programs offerings below). NAEYC's Commission on Early Childhood Associate Degree Accreditation awards accreditation to associate degree programs that meet Professional Preparation Standards for programs preparing early childhood educators. NAEYC's Center for Applied Research has a primary goal of encouraging and supporting all those in the early childhood field to become critical consumers of research about early childhood development and education. The Center for Applied Research curates and communicates research through conference sessions, position statements, reports, research news posts, and other channels to promote the relationships between research, practice, and policy. As part of NAEYC's strategic priority to cultivate leadership and develop innovative strategies that propel the field, profession, and systems of early learning, NAEYC is expanding its role in early childhood education across the globe. Our goal is to provide governments, early childhood programs, and professionals throughout the world access to NAEYC's resources, content, and expertise in early childhood systems. NAEYC's international efforts offer customized support to early childhood communities. We adapt NAEYC's resources and expertise to provide culturally appropriate packages that support optimal early learning and are based on developmentally appropriate practice. The Quality Enhancement Initiatives team also supports our global members through the development of language-specific tracks during the Annual Conference and Expo. Last year, a new initative entitled, Grandes Comienzos, Futuros Brillantes (Great Beginnings, Bright Futures) debuted at the Annual Conference, focusing on the needs of Spanish-speaking children and their families in the US and in Latin America. This year, QEI will continue to offer this program, as well as a similar track for Mandarin-speaking members and conference attendees, called Good Start. Members of NAEYC have the option of also joining one (or several) Interest Forums. These groups are designed to allow members to connect with others who share their same area of focus, interest, or discipline. The were created to encourage the exchange of diverse opinions and to further discussion, dialog, and reflection of particular topics relevant to NAEYC's mission and goals.